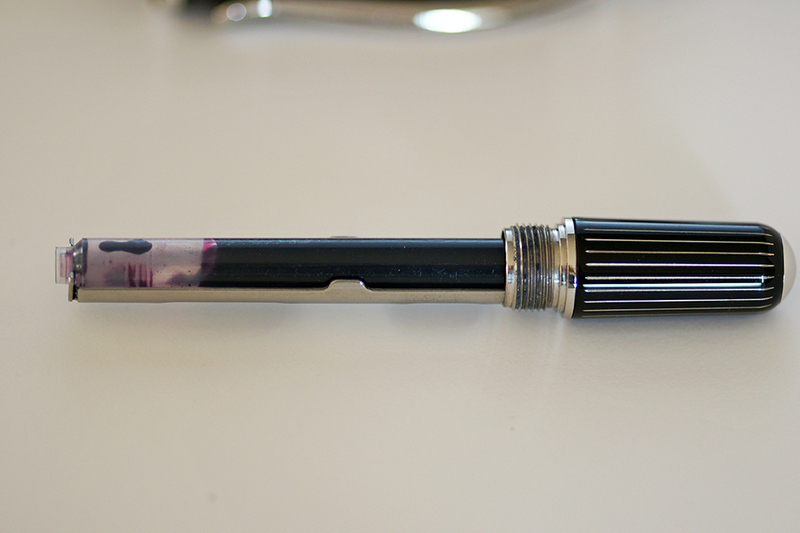 In my review of the Pelikan P200, I alluded to my general disdain for the cartridge filling fountain pen. Intellectually, I understand the void that it fills and just how useful it can be to some. While my personal preference has always gravitated towards Pelikan’s piston filling pens, I do appreciate the diversity available to us and I try to approach each pen with an open mind and strive to keep my pre-formed notions from getting in the way of enjoying a nice pen. 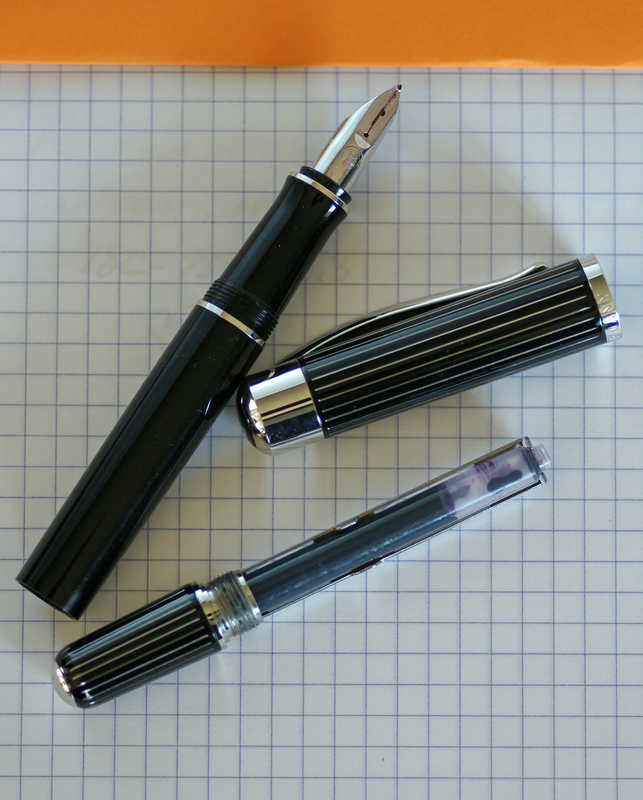 When the opportunity to review the Pelikan P3100 Ductus came along, I was actually excited. The Ductus demonstrates modern styling and was “developed for straightforward people with a unique style” according to Pelikan. The line has since been discontinued as of 2014, marking the end of a seven year run. The name Ductus is reported to be Latin in origin, translating to “guidance” or “leadership”. 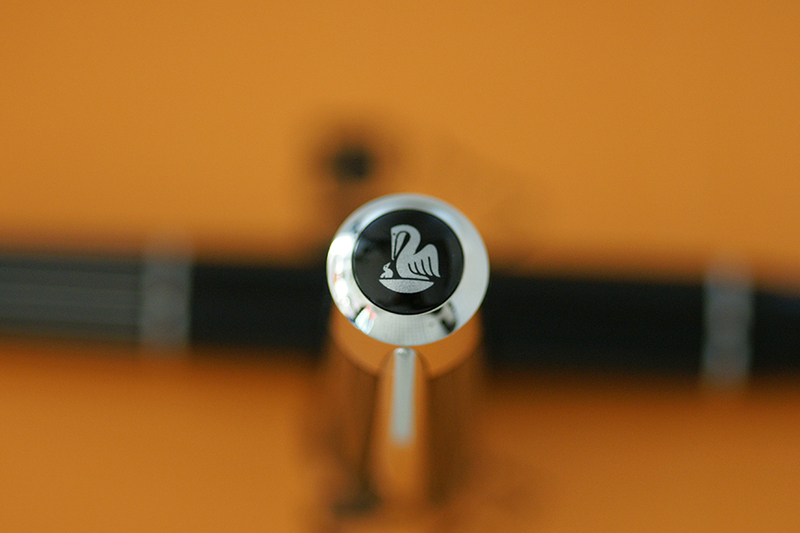 The pen’s styling was welcomed at its release and it won the “Stylus Icon Award 2009” from Stylus Magazine. I can see the merit behind that award. 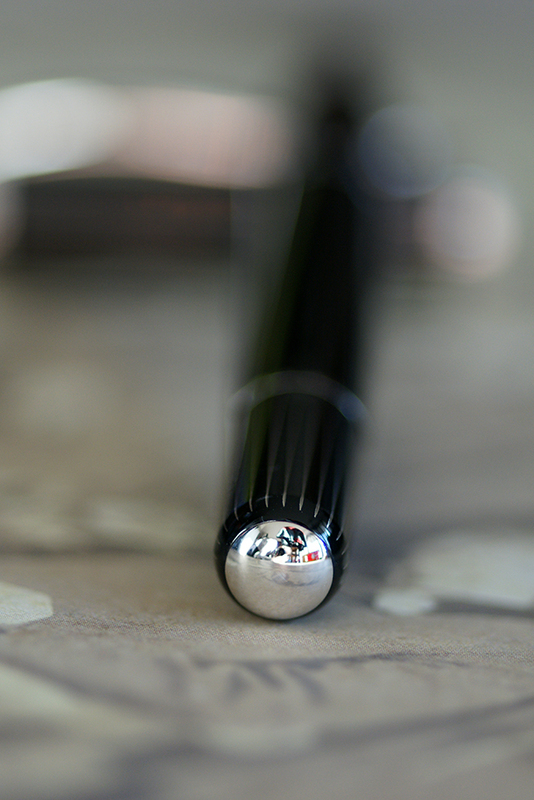 When capped, this pen is sleek and stunning. Read on to find out if that opinion holds up when we take a more in-depth look. The Pelikan P3100 Ductus is a patronen-füller or cartridge pen but you wouldn’t know that by the look and feel of it. The Ductus has a brass barrel which gives the pen a fairly significant and reassuring heft. It certainly has a more robust feel than most other cartridge pens that I have previously encountered. The finish exudes quality craftsmanship and the design gives it a very upscale appearance. Pelikan notes that the barrel is first lacquered and then polished to a high sheen. Afterwards, the lines are created through engraving which is then filled with palladium before a coating of clear lacquer is applied to make the surface smooth. All of this comes together to form a pen with very clean lines. There are three trim rings on the pen; one at the piston knob, one at the front of the barrel (above the cap threads), and one at the end of the section. The cap top has a single chick logo which became plated on pens produced after 2010 (the example shown here dates 2007-2010). The single cap band is engraved, “PELIKAN GERMANY.” I particularly like the appearance of the clip which is a departure from the traditional pelican’s beak that we are familiar with. Where I become a little less positive about the design is evident in the nib and the filling mechanism, both discussed in further detail below. Suffice it to say that when capped, the pen rates a 10 out of 10 in my eyes. Points are lost because the design does not hold up throughout but, if you can put those few issues aside, it’s still a very handsome pen. The Ductus feels absolutely solid and I have no qualms about its construction. The pieces have an excellent fit and finish. My example had a very smooth nib that was perfectly aligned. The cartridge tray threads securely and the cap post well. This is a pen that looks to be durable and more than capable of standing up to decades of use. The thing that surprised me most about the Ductus was its heft. Most cartridge pens that I have encountered have been light in weight but that’s not the case here. The P3100 weighs in at a respectable 1.41 ounces due to the brass barrel construction. That’s 0.38 ounces heavier than an M800 and 0.21 ounces heavier than an M1000. That kind of weight is likely to discourage many who already find those two form factors to be a bit too heavy for comfort. Weight aside, the pen is 5.59 inches long when capped and 6.37 inches when posted making it a touch taller than the M800. It has a diameter of 0.51 inches. A long standard international cartridge should provide a max ink capacity of about 1.4mLs. I was worried that the added weight and length would be disconcerting but the pen is actually quite comfortable to use. When unposted, it does not feel heavy at all and is very comfortable in the hand. It becomes a tad heavy and a bit unbalanced towards the rear when posted but not overwhelmingly so. Perhaps it is due to me being so used to Pelikan’s wonderful design on their Souverän nibs but the Ductus’ nib kind of falls flat with me. It has grown on me with ongoing use but it just doesn’t feel as elegant or refined and detracts from the overall appearance of the pen. The nib is broad and oddly shaped, more like a shovel than a nib. One big thing in its favor is that the nib is 18C-750 gold that is completely rhodium plated. There are a pattern of lines on the most distal aspect of the nib with a smallish Pelikan logo just below that. On the left side of the nib, the size designation is engraved and on the opposite side, “18C-750.” The nib on this example is very smooth and puts down a wet, medium line. I have not had any issues with hesitations or hard starts though I do find that it doesn’t start up as well from a few days rest as its piston filler brethren. Interestingly, I do get a tiny bit of variation between the horizontal and vertical strokes of the nib which is an unexpected and welcomed find. The nib sizes available were EF, F, M, and B. There also appears to have been BB and OB nibs available by special order. Unlike the nibs on the Classic and Souverän lines, I don’t believe that the Ductus nib is removable though I cannot be 100% certain of this. The Ductus has a unique cartridge system which, unfortunately, is the second black eye for this pen. The blind cap is attached to a rigid tray that unscrews from the back of the barrel. This tray will accommodate one long or two short international cartridges. What it will not accommodate is a converter meaning that there is no bottle filling for this model. Don’t get me wrong, you could fill a converter with a syringe and then insert it into the tray but that defeats the purpose. It is a bit disappointing that a high-end cartridge pen of this caliber doesn’t go that extra mile to work with a converter. The nice thing here is that there is no concern about a poorly seated cartridge as the system ensures a good fit. It’s a competent system for a cartridge pen but leaves you a little wanting at this price point. The P3100 Ductus has been discontinued since 2014 but examples can still be found in retail channels. Once these are gone though the only available models will be those found on the used market. The US MSRP is $675-700 while the overseas MSRP is 380€ (~$426). Again we see the huge disparity between US and overseas pricing. 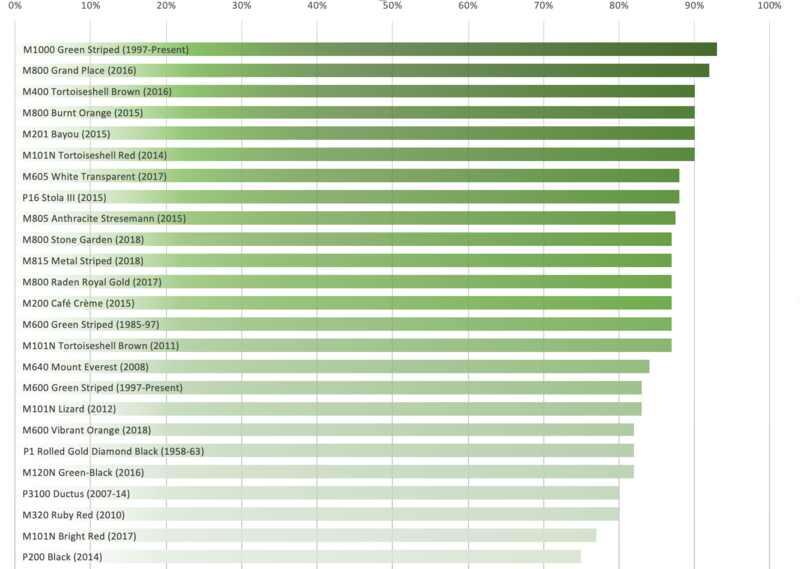 Current street pricing varies but seems to range from $435-540 domestically. I can certainly understand a premium price point as this pen includes an all brass barrel, a rhodinized 18C-750 nib, and palladium trim. It certainly feels like a higher end model but I’m not sure that I would pay the same price for a cartridge only pen as I would for a piston but that is a matter of personal preference. This pen looks to be quite durable so it is likely to be a much better value if you can find an example on the used market. The P3100 Ductus and its gold counterpart the P3110 are aimed at the higher end pen market. It’s a cartridge pen that has a large footprint and an equally large price tag. While its styling is beautiful, it is not without its flaws. The nib is a bit unsightly though very capable and the cartridge system is limited in its implementation. I don’t think anyone could go wrong owning one of these but I’d favor a second-hand purchase given the large price tag to get the most value for your money. The Ductus may not have changed my opinion towards all cartridge pens but it surely makes me rethink that segment of the market. I’m a fan of the Ductus despite its issues and suggest that you check one out if you’re at all interested in a high-end cartridge fountain pen. Great review, as always. Thanks for sharing. I have been thinking about the Ductus lately, as I find that cartridge pens are very convenient for traveling and I don’t think the nib is that bad looking. After seeing this review I guess that if one with the right price comes along I’ll give it a try. It’s interesting that you get some line variation with it. I have two M800 with B nibs, acquired a couple of months ago, that show a clear difference between the horizontal and vertical strokes. My Mt. Everest M also shows some variation. Nothing huge, but still nice. Probably I just got lucky, but it would be nice if Pelikan started to give us nibs with a bit more character (but I guess they have to keep the competition alive, right?). Thanks! I’m glad that you enjoyed the review. I completely agree with your sentiment about Pelikan’s nibs but I don’t see any change on the horizon. 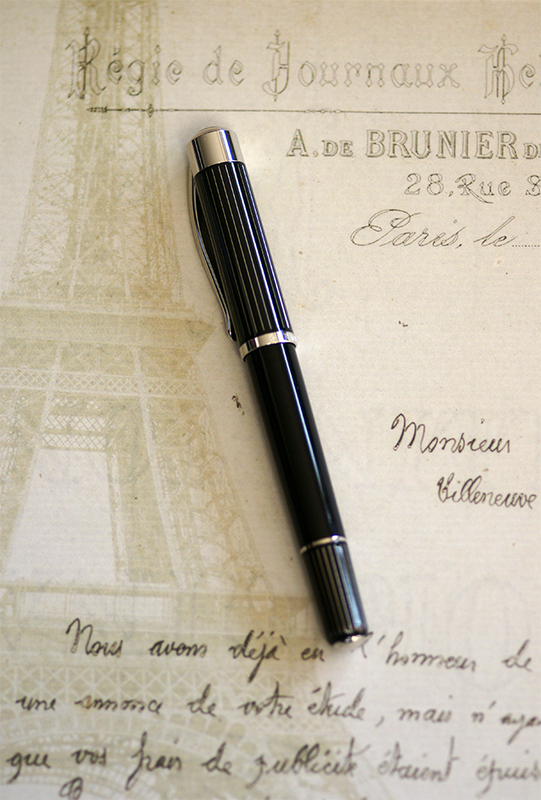 As usual a very complete and informative review on the Pelikan Ductus P3100. Pelikan should make you an honorary member of their Pelikan Board for your invaluable service to the community of Pelikan users and collectors. You flatter me too much Francis but thanks! Joshua, thank you for doing such complete, thorough reviews. I can usually tell by your reviews whether I like a pen or not. And that’s saying a lot, because I can be very picky and inquisitive about all the features of a pen before I buy it. I think this is a very smart-looking pen, while it’s closed. But like you, I don’t particularly like that shovel for a nib thing they have going on. And I’m not crazy about a cartridge-only pen. I like using bottled ink, period. So I do “defeat the purpose” and put ink inside an empty cartridge. The only problem with this is that the old cartridge can wear out, but that’s not really a big deal. It’s just the principle of the thing; I do expect a converter or piston-filler at this price point. I had been curious about this pen, and you have satisfied that curiosity. This is a decent-looking pen, but with the nib and cartridge fill system, I don’t think I’ll be getting one. I like Souverans too much. You’re welcome. I’m happy to hear that my reviews are useful to you. I think a lot more people were thinking about the Ductus than I had suspected based on feedback which was surprising to me. I appreciate your input Rajesh as I’m certainly known to make and error from time to time. I’ve looked over section 5 closely a few times now and can’t see the mistake your alluding to. Each use of the word ‘converter’ in that section is as intended. Dear Joshua. Thank you for this review. You may recall I sent you an email several months ago asking why the Ductus pen was not included in the Pelikan Perch. I appreciate it that you have reviewed it. A very thoughtful review for what some believe is a controversial pen. I have owned the gold trim version for well over 5 years. It writes very well and I like the look of the nib. My only complaint is that is very heavy posted and I need to post as I will likely lose the cap otherwise. Again, thank you for including the Ductus on the Perch. You’re welcome but I must thank you for the suggestion. That is one of the reasons that I pursued a discussion of the Ductus. It’s not surprising to hear that the P3110 has served you well. It’s a well built pen. Thanks again and I encourage anyone that has a suggestion for future content to share it and I’ll certainly see what I can do. I think the nib needs to be taken in the context of the overall pen. To me this is very much a modern looking pen and as such, try to imagine your reaction if upon removing the cap you found a traditional Pelikan nib. In my mind that would be a disaster, Akin to a smoke stack from a steam era locomotive mounted on a diesel electric streamliner from the 1950’s. 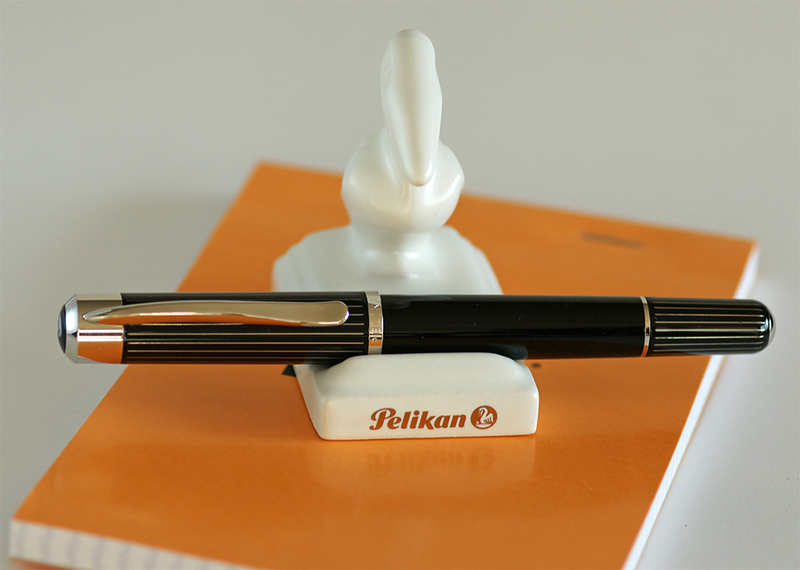 I think the slim stripes bring a touch of class and remind me very much of the Stressman which seems to have been a tremendous hit among Pelikan aficionados. This pen would not fit in my collection but I would certainly consider one for a EDC if it were available for cheap. Your point is well taken. I agree that the traditional nib simply would not work here. Again, the nib has grown on me with use but I still think there is something more they could have done with it. What I can’t argue is that it may not be to my taste as far as looks go but the nib writes like a dream. Thank you for your comments and insight. That’s an excellent review of a handsome pen (I have very open views on the matter of point aesthetics). Something which strikes me about that filling system is the apparent difficulty of giving it a good flush– the usual approaches to driving lots of water through the feed of a C/C pen are rather blocked with this pen. Not as entirely unflushable as a Level, perhaps, but it looks like a challenge. Thanks! It’s actually not that big of a deal to flush. I was able to successfully clean it out with a bulb syringe and minimal hassle. I also don’t see an issue running it under the sink though I prefer the bulb syringe for these jobs. I’d say ease of cleaning is fairly high with this one which is a plus. It’s always good to have chimerical fears put to rest, and to hear that a pen company hasn’t rendered a pen un-cleanable. Thanks! Thanks and you’re welcome! Glad to have helped you with your decision. Thanks Tarah! I suspected that it was removable but wasn’t brave enough to give it a try. I really appreciate you sharing your experience. After seeing this review I decided to give the Ductus a try (as I mentioned above), and I have a question: are you sure that the barrel is brass? It seems plastic to me. The blind cap and cap are certainly metal, but I weighed the barrel (without the blind cap) and it is just 0.26 ounces (7.3 grams). Hello Luiz. That bit of info came directly from Pelikan’s own website. The pens description includes, “The brass barrel is first lacquered, then turned into the right form, and then polished to a high sheen.” That said, I’m inclined to think that you may be correct. I weighed the pieces and the cap is 17g, the blind cap is 15g, and the barrel and nib weigh just 8g. That would seem inconsistent. Good eye! Thanks a lot for going through the trouble of weighing it. I was a little worried because nowadays we can’t find these pens in the usual stores. But everything else seemed fine. It is strange that Pelikan says the barrel is brass, but probably just a mistake in the website. Agreed. I hope that you enjoy your Ductus. Thanks for the excellent review. I recently purchased one golden version mentioned “like new” at 196 US $ which seems a good price to me.The pen hasnt reached me as yet. I like the look of the pen, seen in the images and the video. Personally I feel its prettier than M800. I think the unique shape of the nib adds beauty to the pen. Collectors would always prefer different shapes so long as they write well. The nib of Waterman Edsons or Sheaffer Imperials also look different but they are excellent pens. A part of barrel could be resin to keep the total weight of the pen manageable. I am eagerly awaiting the pen. Congrats! Sounds like you got a great deal. I think that you’ll be happy once it arrives. Enjoy it. Hi Josh. I just returned from Europe w two new additions. A Visconti Van Gogh that I got in Amsterdam and a Ductus from Berlin. Popularity notwithstanding I really like the look and feel of this non traditional bird and it compliments my 3 M8xx pens nicely. cartridge filling doesn’t bother me but I ran into an issue right away that I figured you will know the answer to. The long cartridge that came w the pen doesn’t puncture when the cart is fully screwed down. Before I start picking at it… is there any special covering preventing it from opening? #2. I tried two Montblanc short cartridges and they are a tad too long to fit in the cart carrier. (Are they not true international shorts or am I missing something?). Thanks! Congrats on the two new additions to your fountain pen family. The Ductus is a great pen. I only let mine go because I’m not a big fan of cartridge pens and I never fell in love with its looks like I wanted to. It was certainly one of the most substantial cartridge pens I ever used. I was thinking about the proper orientation of the cartridge and I’m glad the solution was something as easy as that. I find the Ductus works best with long international carts. 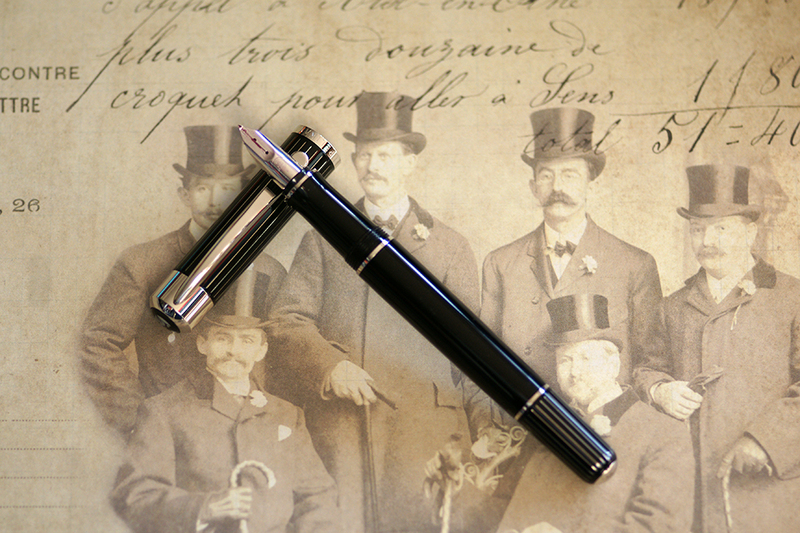 I’ve never used Montblanc’s offerings so can’t comment on their size. Enjoy the new bird. I found them to be great writers.